Today: Peter and Mary Jane decided to sell their marriage to Mephisto in a last-ditch effort to save Aunt May from death, effectively wiping the events of this issue out of existence. No, we’re not still bitter at all. Why do you ask? Rebecca: Last month, I had the honor and privilege to walk down the aisle with my wonderful husband — no furry red devil dudes stood in our way. Despite that, Kayleigh and I are going to keep this series going until we run out of weddings we want to talk about, because we’re fun like that. 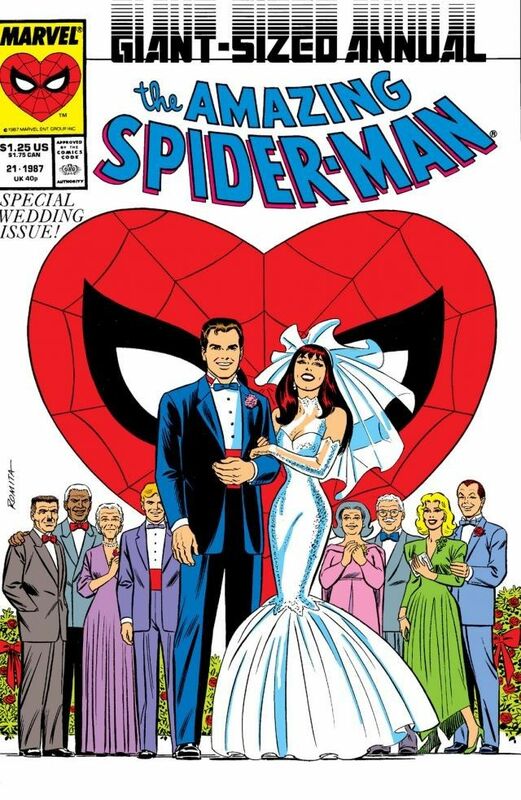 Anyway, I’m completely biased but I picked this issue specifically for my own post-wedding spotlight because despite its eventual ending that led to me swearing off the Spider-Man franchise all together, this is still one of my favorite wedding issues. 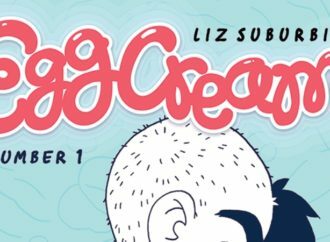 Part of it is nostalgia — I read it multiple times as a kid after my younger brother somehow convinced my Dad to buy it for him at a famous local comic book shop that you probably have some strong feelings about. Part of it is just shipper bias — Spider-Man was my favorite superhero for decades and I think his relationship to Mary Jane was one of the best in comics. 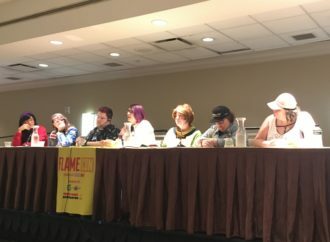 It developed over a long period of time, the characters complemented each other (he’s an awkward nerd/she’s outgoing and likes to party) and they were just funny and likeable in general. Yet I do genuinely think Amazing Spider-Man Annual #21 is a great wedding issue. Aside from the we-had-to-get-at-least-one-in-somewhere opening fight with Electro, the book mostly puts the superheroics aside for the slice-of-life dramas of telling your relatives about your engagement and bachelor parties. I also like how new-reader-friendly this book is. 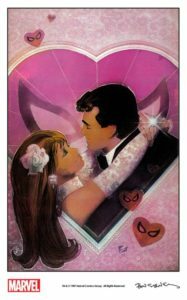 If you don’t know characters like Betty Brant, Anna Watson or Gwen Stacy (whose ghost hangs pretty heavily over this story), the book takes a lot of time out to tell you who they are and what they mean to the characters. Kayleigh: I really love Peter and Mary Jane as a couple. They’re one of the great romances in superhero comics, starting all the way back in ASM #15 when Aunt May first tried to set up Peter with “Mrs. Watson’s niece” next door. 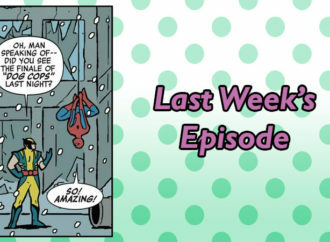 From that running gag to their fabulous first meeting, to MJ as the Veronica to Gwen Stacy’s Betty, to MJ becoming Peter’s surprising confidant and true love after Gwen’s death…for my money, Mary Jane will always be the most vibrant and fun and just plain interesting of Peter’s love interests. It’s not like “Face it Tiger, you just hit the jackpot!” is one of the most famous first appearances in comics history, or anything. Rebecca: Peter and MJ always had their fans — according to former Marvel Editor Jim Shooter the marriage was spurred by a fan asking him and Stan Lee at a convention if the two would ever marry and the crowd agreeing. 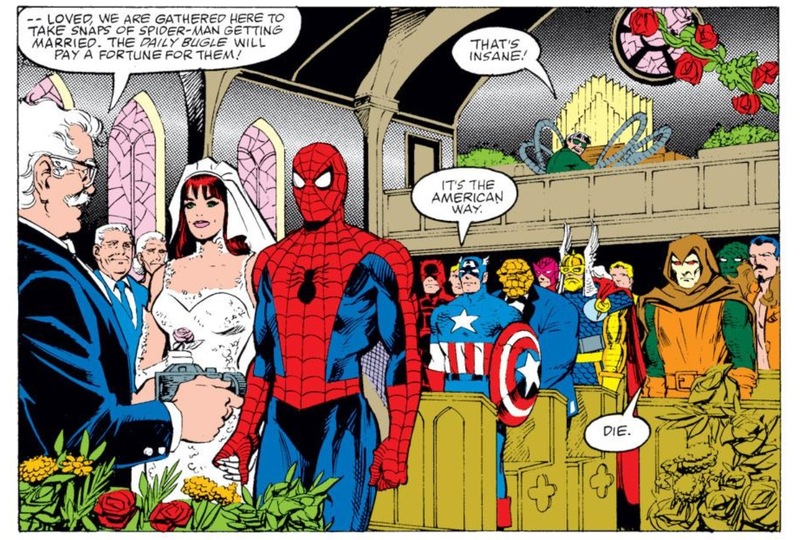 Yet the marriage also always had its detractors in the industry like Christopher Priest, Roger Stern and John Byrne (by the way, if you’re a Peter/MJ shipper don’t click that last link unless you enjoy being mad for hours). I doubt writer David Michelinie was one of those detractors given how often he wrote married MJ and Peter throughout the 1990s, but reading this issue in 2017 it’s hard not to see the industry ambivalence as a running subtext. Most of the conflict comes from Peter and MJ wringing their hands over whether or not the wedding is a good idea, Peter because he’s worried about the commitment or if he’s setting up Mary Jane to be killed like Gwen, Mary Jane because she’s still new to the idea of being with a superhero and worried about having to give up on her party-going ways. It’s … kind of annoying, to be honest. A lot of the time I wanted to knock the characters’ heads together and tell them to just take some time to talk stuff out — there’s no reason you need to race through the wedding planning so darn quickly. Then again, everyone from Aunt May to Harry Osborn to Flash Thompson tells Peter to lighten up and just be happy for once, so it kind of works out. Rebecca: I have to say my favorite moments in this issue were the smaller, character-building ones. The scene where MJ and Peter tell their Aunts May and Anna (who already suspected) that they’re getting married is incredibly sweet. I also really like MJ and Peter’s talk on the top of the Empire State Building. 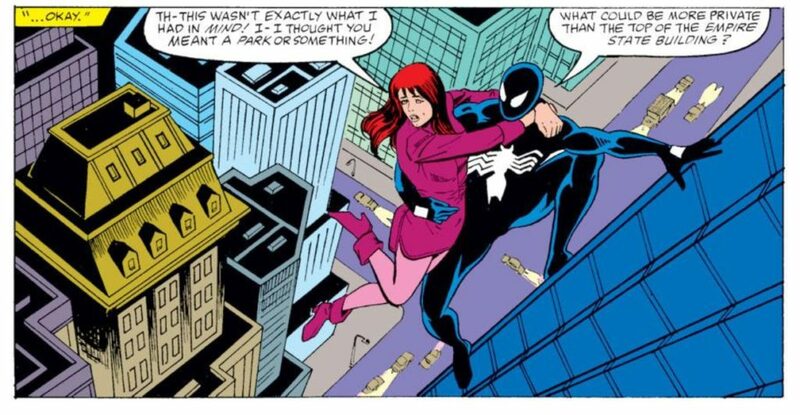 It does lead to some Peter-angst, but I really like how MJ grows used to the idea of being married to a superhero as she clings to him climbing up buildings and web-slinging across the city. It’s the sweet spot where the fantastic and ordinary parts of the Spider-Man mythos hit. 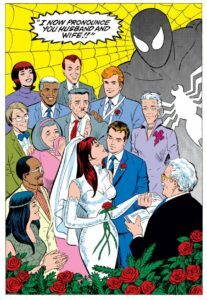 Rebecca: ASM Annual #21 was published with two variant covers — one where Peter’s in his blue wedding tuxedo with wedding guests such as J. Jonah Jameson and Liz Allan behind them, another with Peter as Spider-Man where fellow Marvel superheroes are readying to fight supervillains in the background. 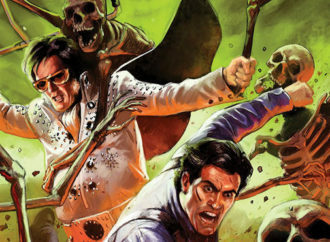 The latter represents a fairly awkward dream sequence where the spandex-clad dudes fight at the wedding. The actual wedding is a rather ordinary affair at City Hall in Manhattan (even if both MJ and Peter show up over an hour late). It’s a sweet wedding, but I do have one bone to pick with it. I can kind of understand why Peter picked Flash instead of Harry to be his best man. At this point in time, Flash merely had a history of bullying Peter while Harry had a history of dressing up as a Goblin and trying to kill him before conveniently getting amnesia. Yet my real question is why the hell does a popular model with dozens of men and women at her bachelorette party not have any friends? Or even a solid maid of honor? 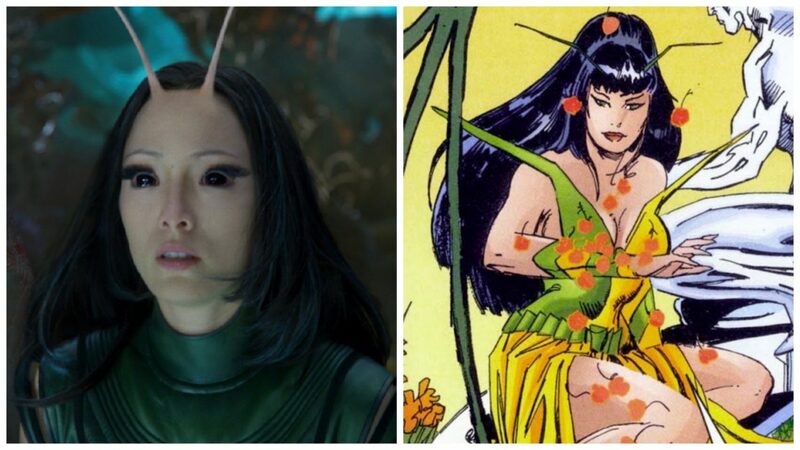 I guess you could say she keeps people at a distance, but that’s a part of the mythos that really strikes me as being written by guys who don’t know how women work. Okay, this dream sequence got me. 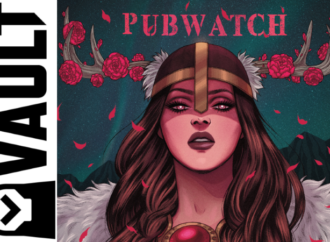 Kayleigh: This annual doesn’t take Mary Jane’s career seriously at all, presenting her lifestyle as a non-stop party where she’s surrounded by shirtless beefcakes who want to take her to Paris and are implied threats to her fidelity to Peter. Whether or not marriage is compatible with her modeling career is a legitimate, drama-stirring question, and I don’t think Michelinie had bad intentions here, but uncharitable readers could easily use this as kindling for their sexist “Mary Jane was an ‘easy’ party girl who was never good enough for Peter to marry” bonfire. A single page of MJ talking to another female model (who doesn’t even need to appear again!) would have made such a difference. Rebecca: And now for the fashion review! There’s a lot of dull pastel suits in this one — Peter basically just came to the wedding in his Daily Bugle suit with a red rose on it — although I do appreciate how May and Anna are wearing age-appropriate if plain Mother-of-the-Bride dresses as well as that one unknown lady wearing a 70s headband about 10 years too late. Still, Mary Jane’s mermaid dress is the real standout. Like Jean Grey’s, it was done by an actual fashion designer, Willi Smith (and made an appearance in the real-life promotional wedding ceremony at Shea Stadium). Sadly, Smith died of AIDS-related complications before this issue was released, but he does make a cameo in the actual issue to give MJ her wedding dress. Kayleigh: I can’t even pretend to be objective about whether MJ’s dress is good fashion or not–that Romita cover was burned in my memory long before I read the actual issue, and I love it in all its 80s shimmery mermaid glory. There’s even a Barbie doll of Mary Jane in her wedding dress, which has been secretly hiding in my Amazon wishlist for a long time. It’s a gown with a lot of personality, which is perfect for Mary Jane, and it single-handedly makes their rushed wedding on the courthouse steps feel like a big event. 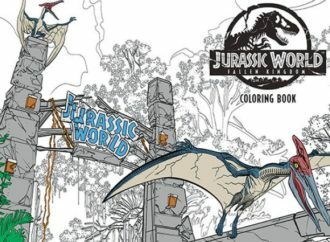 Rebecca: I have to be honest, it’s been kind of bittersweet to come back to this issue considering the ignominious way it ended. That being said, the issue itself has a lot of charms. I wish I could read it without the spectre of Marvel’s decades-long wish to unravel the marriage hanging over it, but then again maybe that was a web-line that eventually had to snap. And for a while, they did.